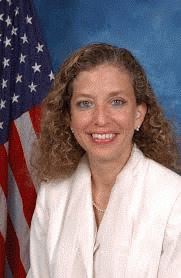 "Democratic National Committee Chair Debbie Wasserman Schultz prevented consideration of a resolution at the party's summer meeting here [Minneapolis] that praised President Obama and offered backing for the nuclear agreement with Iran, according to knowledgeable Democrats. "The resolution was drafted with the intention of putting the national committee on record in support of the agreement as Congress prepares to take up the issue when members return from their August recess." The Post attributes Wasserman Schultz's betrayal of the president to Jewish political concerns in her South Florida district. "Wasserman Schultz, who represents a heavily Jewish congressional district in south Florida, has not taken a position on the agreement. She faces significant pressure to break with the president and oppose the deal." I bet this is about raising money nationally. Wasserman Schultz isn't concerned for her own district but the strength of the party nationally. Her stance also helps explain why NY Senator Chuck Schumer came out against the deal: because he wants to raise money to help Democratic Senatorial candidates next fall, so that they will then vote to put him in as party leader. He thinks that opposing the deal is where the money is. And after all, opponents of the deal are spending as much as $100 million against it. Presumably they'll spend that much again in 2016 on their friends. "Democratic National Committee Chair Debbie Wasserman Schultz refused to say on Wednesday if she'll back the president's nuclear deal with Iran, even as she arranged a personal meeting between Vice President Joe Biden and Jewish leaders in her district. Biden, who is already mulling a presidential bid, was scheduled to attend a senatorial fundraiser in Miami on Sept. 2, so it was easy to add the roundtable event in Wasserman Schultz's nearby district the following day." Antiwar.com's Jason Ditz says that her stance was a surprise. "That she used her position at the DNC to block this resolution, however, is a surprise." The surprise is that she doesn't lose her job in an instant, when President Obama is struggling to hold Democrats in support of the deal. And the reason she doesn't is because the president is cognizant of the political forces that are bearing on her. On Friday, after all, he had the Jewish Federations chief and the chair of the Conference of Presidents in to the White House to try and sell the deal to a dubious Jewish leadership. The average Joe Jew may be for the deal, but the older, Israel-loving Jews are very dubious. And they give a ton of money.